Sensory strategies for the perception of mechanical cues are essential for survival. However, our understanding of the underlying molecular mechanisms is far from complete. G protein-coupled receptors (GPCRs) hand over stimulus-induced conformational changes to metabotropic signaling outlets that carry the signal to intracellular destinations. Adhesion-type G protein-coupled receptors (aGPCRs) display structural characteristics that distinguish them as a separate family within the GPCR superfamily (Hamann et al., 2015). Remarkably, as opposed to the majority of GPCRs, aGPCRs interact through their N-termini with membrane-tethered or ECM-fixed partner molecules rather than soluble compounds indicating that their function requires positional fixation outside the receptor-bearing cell (Langenhan et al., 2013). Several aGPCRs have recently been linked to mechanosensitive functions (Petersen et al., 2015; Scholz et al., 2015; White et al., 2014). These examples collectively suggest that processing of mechanical stimuli may be a common feature of this receptor family (Langenhan et al., 2016). However, while elemental signaling properties of aGPCRs have recently become available (Hamann et al., 2015), a molecular model of their signal transduction strategy is at large. By combining genomic engineering with electrophysiological recordings, super-resolution microscopy and optogenetics, we have determined the critical steps that are required to transduce a mechanical stimulus into an intracellular response by an individual aGPCR, Drosophila Latrophilin/dCIRL. We have taken advantage of the functional modulation of mechanosensory neurons by dCIRL and the accessibility of this system for physiological interrogation in vivo. Our results show that dCIRL is located in the neuronal dendrites and cilia of chordotonal organs (ChOs), the sites of ionotropic mechanotransduction (Ranade et al., 2015). dCIRL specifically shapes the generation of mechanically-gated receptor currents but is dispensible for normal membrane excitability of ChO neurons. Lengthening dCIRL’s N-terminal fragment (NTF) gradually reduces mechanosensory neuronal responses. This is consistent with a model in which mechanical tension applied to the receptor determines the extent of its activity. In contrast, autoproteolysis of the GAIN domain is not essential for dCIRL activity, which instead requires an intact Stachel sequence. Finally, we show that mechanical stimuli effect a dCIRL-dependent decrease of cAMP levels in ChO neurons. To precisely determine the expression of dCirl in larval mechanosensory chordotonal organs (ChOs), we used a dCirlpGAL4 promoter element to drive the nuclear reporter UAS-GFP::nls and analyzed immunohistochemical stainings against GFP and HRP, a comarker of ChO neuron structure. In the larval pentascolopidial ChO (lch5) only the five neuronal nuclei were marked (Figure 1a), showing that dCirl is a neuronal gene. To obtain a translational expression profile of dCIRL, we constructed a genomic transgene that contains an mRFP cassette inserted into an exon encoding part of the extracellular domain (ECD) of the receptor at a position where its folding and trafficking should not be affected (dCirlN-RFP; Figure 1—figure supplement 1) (Scholz et al., 2015). The dCIRLN-RFP fusion protein could be observed in the lch5 at the level of the dendrite and cilia (Figure 1b). Next, we employed super-resolution imaging by structured illumination microscopy (SIM) to resolve the subcellular arrangement of dCIRL in greater detail (Gustafsson, 2000). SIM images depicted a patchy distribution of dCIRLN-RFP at the membrane of the lch5 dendrite and cilium, where it localized near the TRP channel TRPN1/NompC (Yan et al., 2013; Zhang et al., 2015) (Figure 1c). This demonstrates that dCIRL resides at the location where ionotropic mechanosensation operates. dCIRL is located at the site of ionotropic mechanosensation. (a) The dCirlpGAL4 driver demonstrates exclusively neuronal expression of dCirl within lch5 ChOs (dCirlpGAL4>UAS-GFP::nls). Rightmost mechanosensory neuron (soma and dendrite) within the organ marked by a dotted line. (b) Maximal projection of a confocal image stack of lch5 (counterstained against acetylated tubulin; green) showing dCIRLN-RFP (magenta) enrichment at the level of the distal dendrites and cilia (arrowheads). (c) SIM imaging shows dCirlN-RFP (magenta) in the distal dendrites (arrowheads) extending to the ciliary compartment, where the receptor is coexpressed in the same subcellular region with the TRP channel NompC (green). lch5 was counterstained with α-HRP, asterisk indicates ciliary dilation. Note that SIM resolves the canal through which the cilium passes. (d) Composition of the larval pentascolopidial organ (lch5). (e) Scanning electron micrographs of lch5 from control and dCirlKO animals. The organ consists of a chain of support cell types that suspend the mechanosensory neurons (blue) between body wall and musculature. No morphological abnormalities are apparent in the mutant. Scale bars, (a–c) 5 µm; (e) 10 µm. See also Figure 1—figure supplements 1 and 2. As dCIRL possesses molecular characteristics of adhesion molecules, we performed ultrastructural analyses to ascertain that removal of dCirl does not affect the complex architecture and structural integrity of ChOs. Scanning electron microscopy uncovered no structural anomalies in dCirlKO mutants (dCirlRescue: n = 11 ChOs from 5 larvae; dCirlKO: n = 11 from 5 larvae; Figure 1d,e). Additionally, the ultrastructure, cell-cell and cell-matrix contacts of distal inner dendrites and cilia appeared unaltered in transmission electron microscopy (dCirlRescue: n = 9 ChOs from 6 larvae; dCirlKO: n = 15 ChOs from 8 larvae; Figure 1—figure supplement 2). Thus, all ChO cell types and their serial interconnections are present in the mutant demonstrating that removal of dCirl does not interrupt the complex architecture and cytology of the larval lch5. This corroborates earlier findings, based on fluorescence microscopy of molecular markers (Scholz et al., 2015), that dCirl is not involved in the structural specialization of ChOs. 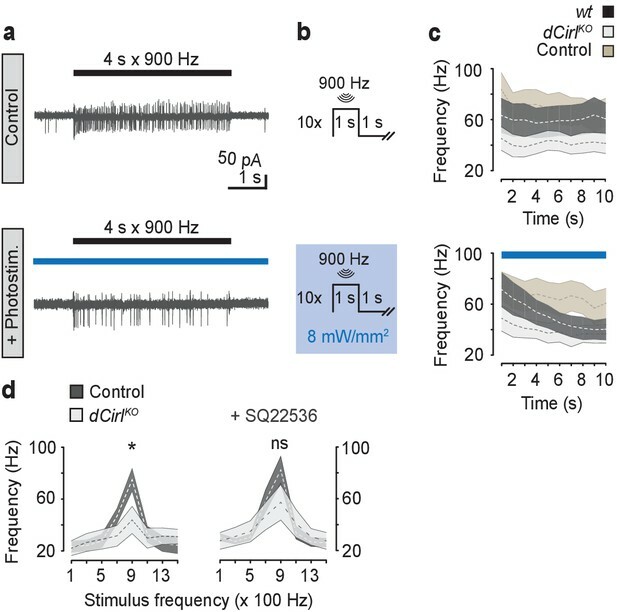 Two qualitatively different forms of electrical activity mediate signal transduction and transformation in primary sensory neurons, such as the bipolar nerve cells of ChOs. During transduction, stimulus encounter by sensory receptors is converted into current flow through ion channels to generate the receptor potential. This membrane depolarization is then transformed into a train of action potentials by voltage-gated ion channels to carry the sensory signal along the axon. dCIRL increases the mechanically-induced firing frequency of ChO neurons (Scholz et al., 2015). We reasoned that the light-gated cation channel Channelrhodopsin-2 (Nagel et al., 2003) [ChR2; retinal-bound channelopsin-2 (Chop2)] could be used to distinguish whether this effect was exerted at the level of mechanosensory transduction or transformation. Because ChOs are also thermoresponsive (Liu et al., 2003), this strategy necessitated an efficient ChR variant to limit the heat generated by the required light intensities. We therefore screened for a ChR2 version that combines high photostimulation efficiency (Dawydow et al., 2014) with good temporal precision. The D156H mutant displayed very high expression in Xenopus oocytes upon inspection by confocal microscopy (Figure 2a), while retaining favorable kinetic properties, especially after short light pulses (10 ms: 𝜏off1 = 11 ± 1.2 ms SD, 𝜏off2 = 1.1 ± 0.13 s SD; Figure 2b), and over ten-fold larger photocurrents than the wildtype version (ChR2-wt; Figure 2c). We therefore named the ChR2D156H variant ChR2-XXM (extra high expression and medium open state). (a) Expression of ChR2-WT::YFP and ChR2-XXM::YFP in Xenopus oocytes (without retinal supplementation) imaged by confocal microscopy. (b) Representative photocurrents of ChR2-XXM::YFP in oocytes (473 nm, ~12.4 mW/mm2). Short light pulses are followed by a rapid biphasic photocurrent decay (𝜏off1: 80%, 𝜏off2: 20%), whereas the longer time constant (𝜏off) dominates upon prolonged photostimulation. Data are presented as mean ± SD, n = 4 recordings from individual oocytes incubated with 1 µM all-trans-retinal. (c) Quantification of photocurrent amplitudes in oocytes with and without retinal supplementation. Data presented as mean ± SEM. ChR2-wt + retinal: 0.999 ± 0.5272 µA, n = 4; ChR2-wt - retinal: 0.317 ± 0.0570 µA, n = 5; ChR2-XXM + retinal: 19.675 ± 1.9458 µA n = 6; ChR2-XXM - retinal: 8.982 ± 1.5718 µA, n = 8; p<0.00001, Student’s t- test. (d) Two-electrode voltage clamp (TEVC) recordings at the NMJ show that photostimulation of motoneurons (440 nm) via ChR2-XXM::tdTomato elicits excitatory postsynaptic currents (EPSCs), which can be stimulus-locked using short, low intensity light pulses. (e) Localization of ChR2-XXM::tdTomato in lch5 dendrites (arrowheads). (f) Example recording from the lch5 axon bundle showing a train of action currents elicited by photostimulation of sensory neurons via ChR2-XXM::tdTomato. The burst gradually decays after the light pulse, reflecting the kinetics of channel closure. (g) Quantification of action current frequencies in lch5 neurons expressing ChR2-XXM::tdTomato upon increasing irradiance. The activity of ChOs scales with light intensity and is independent of dCirl. No light response when the transgene is omitted. Data are presented as mean ± SEM. n = 10 per genotype. Numbers denote p values of comparisons of event frequency at 5.42 mW/mm2 irradiance with a Student’s t- test. Scale bars, (a) 500 µm; (e) 5 µm. See also Figure 2—figure supplements 1 and 2. Imaging, electrophysiological recordings and in vivo assays confirmed the utility of ChR2-XXM at the neuromuscular junction (NMJ; ok6-GAL4; Figure 2d, Figure 2—figure supplement 1) and in ChO neurons (iav-GAL4; Figure 2e,f, Figure 2—figure supplement 2) of Drosophila. To examine whether dCirl supports the initiation of action potentials in mechanosensory neurons, we recorded from the Ich5 axon bundle during photostimulation via ChR2-XXM. Photoinduced action current frequencies were indistinguishable in control and dCirlKO animals over the entire irradiance spectrum (Figure 2g). 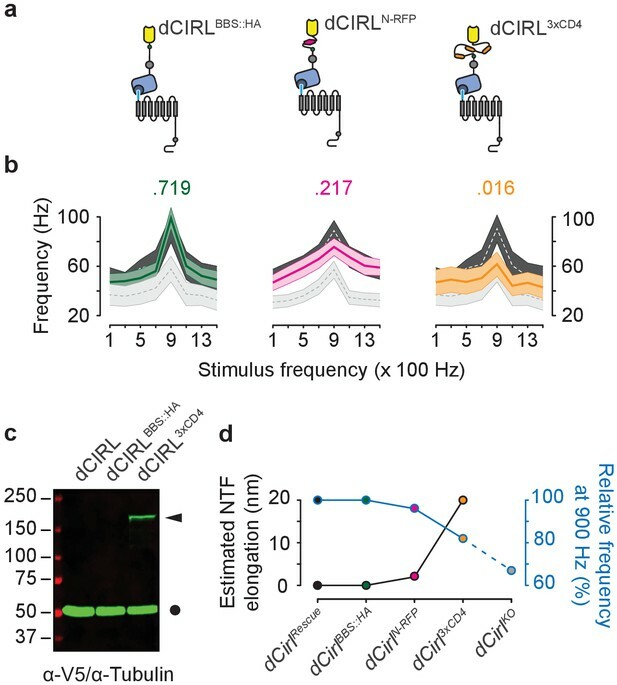 Thus, by bypassing the receptor potential, this optogenetic approach demonstrates that dCIRL does not promote membrane excitability per se to help initiate and propagate action potentials in the sensory neuron. Because ChOs respond to temperature changes (Liu et al., 2003) we tested whether dCIRL also processes this non-mechanical stimulus. Action current frequencies in lch5 afferents gradually increased with rising temperature, roughly doubling from 15°C to 30°C (Figure 3a,b). Notably, dCirlKO neurons displayed unaltered thermosensory electrical activity, while bouts of mechanical vibration evoked lower action current frequencies in the mutant. Interestingly, this difference was most pronounced at 20°C and was partially compensated by low and high temperatures (Figure 3b). These findings demonstrate that dCIRL plays a mechano-specific role in this sensory organ. dCIRL shapes mechanosensory signal transduction. (a) Recordings of wildtype lch5 action currents at 15°C and 30°C without and during mechanical vibration at 900 Hz applied to the cap cell. (b) Quantification of action current frequencies without (dashed line) and with (solid line) mechanical stimulation in control (black) and dCirlKO larvae (gray). Asterisk denotes p≤0.05 comparing event frequency at 20°C with a Student’s t-test. Data are presented as mean ± SEM, n = 8 animals per genotype. (c) Current recordings from lch5 neurons during 900 Hz mechanical stimulation in the presence of TTX (average of 10 sweeps). The wildtype (black) receptor current displays phasic (yellow shaded area) and tonic (gray area) components, both of which are strongly reduced after removal of dCirl (gray). (d) Quantification of phasic and (e) tonic current amplitudes across a stimulation range from 100 to 1500 Hz. Data are presented as mean ± SEM, n = 8 per genotype. Asterisks denote comparisons of current amplitude with a Mann-Whitney U test (*p≤0.05, **p≤0.01). Next, we blocked voltage-gated sodium channels with tetrodotoxin (TTX) to isolate mechanosensory receptor currents. As a result, the initiation of action potentials is prevented and isolated receptor currents can be assessed. Both phasic and tonic current components were strongly reduced in dCirlKO neurons (Figure 3c–e), providing direct evidence that dCIRL modulates the receptor potential evoked by mechanical stimulation. We observed that a diminished yet graded receptor current profile persisted upon increasing vibrational cues even in the absence of dCirl. This feature further attests to the fact that dCIRL controls the sensitivity of mechanosensory neurons towards mechanostimulation rather than the neurons’ principal ability to respond to mechanical challenge. Characteristic of aGPCRs, dCIRL possesses a long extracellular N-terminus with adhesive properties that anchors the receptor to the extracellular matrix or to opposed cell surfaces via cognate ligands. By applying mechanical tension to the ECD this setting may facilitate the reliable transmission of mechanical deformation to the receptor. We sought to test this hypothesis by relaxing dCIRL’s extracellular region via gradual elongation of the ECD through the insertion of spacer elements. All transgenic constructs were expressed from the genomic dCirl locus (Figure 1—figure supplement 1) (Scholz et al., 2015) and a small Bungarotoxin binding site fused to a hemagglutinin tag (dCirlBBS::HA) served as an insertion site control. Action current frequencies of dCirlBBS::HA neurons were comparable to wildtype indicating that cassette insertion did not interfere with structure or expression of the receptor (Figure 4a,b). Elongating the ECD through an mRFP cassette (dCirlN-RFP), which adds at least 2 nm, blunted the response at 900 Hz and a substantial length increase by the 3xCD4 spacer marked with poly-V5 tags (dCirl3xCD4; Figure 4a,c), which adds approximately 20 nm, flattened the activity profile across the entire stimulation range (Figure 4b). We therefore hypothesize that ECD length and tensile properties may adjust dCIRL’s response towards mechanical challenge (Figure 4d). Extending the dCIRL NTF reduces the mechanosensory response. (a) Upper panel, protein design of dCIRL elongation constructs bestowed with an HA::BBX fusion tag (left, green circle), an mRFP moiety (middle, magenta hexagon), or a triple CD4 immunoglobulin repeat cassette (right, orange ovals). All spacers were integrated into the same site within the dCIRL NTF just C-terminal of the RBL (rhamnose-binding lectin) domain. Schematics not to scale. (b) Action current frequencies plotted against mechanical stimulation. Response curves of wildtype (dCirlRescue; dark gray) and knockout (dCirlKO; light gray) lch5 neurons recorded in the same experiment are displayed for comparison. Data are presented as mean ± SEM. dCirlBBS::HA/dCirlRescue/dCirlKO (n = 10/20/20); dCirlN-RFP/dCirlRescue/dCirlKO (n = 20/20/20); dCirl3xCD4/dCirlRescue/dCirlKO (n = 10/20/20). Numbers above plots denote p values of comparisons with a Student’s t-test between dCirlRescue and respective elongated dCirl variants at 900 Hz stimulation, n denotes number of larvae. (c) Western blot showing stable expression of the dCIRL3xCD4 fusion protein in vivo. Protein extracts from animals (10 per genotype) were blotted and immunostained with an α-V5 antiserum specifically detecting the elongated NTF of dCIRL3xCD4 (ca. 177 kDa) bestowed with poly-V5-tags (arrowhead). Consistent with previous results on the high efficiency of GAIN-mediated dCIRL autoproteolysis (Scholz et al., 2015), no full-length receptor was found. α-Tubulin staining was used as loading control (circle). (d) Relationship between estimated NTF elongation (black curve) and lch5 response frequency (blue curve), normalized to respective dCirlRescue responses. All aGPCRs contain a juxtamembrane GPCR autoproteolysis inducing (GAIN) domain (Araç et al., 2012), which catalyzes receptor cleavage in N and C-terminal fragments (NTF, CTF) and maintains the two non-covalently affixed (Gray et al., 1996). This unusual property may be required for protein folding and trafficking (Prömel et al., 2013) or to expose the receptor’s tethered agonist (Stachel), which begins at the GPCR proteolysis site (GPS; Figure 5a) (Krasnoperov et al., 1997; Lin et al., 2004) and can potently stimulate receptor activity (Liebscher et al., 2014; Stoveken et al., 2015). To test this assumption, we abolished autoproteolytic activity of the GAIN domain in two sets of dCirl alleles by mutating the −2 (dCirlH>A) or +1 (dCirlT>A) position of the GPS (H−2L−1↓T+1; Figure 5a,b) (Prömel et al., 2012), notably the latter within the Stachel sequence. In the first set, the GPS mutations were inserted into the RFP-tagged receptor background (dCirlN-RFP/H>A, dCirlN-RFP/T>A), and in the second set, the unmodified dCirl template was mutated (dCirlH>A, dCirlT>A). We prepared protein extracts from dCirlN-RFP/H>A and dCirlN-RFP/T>A flies and immunoblotted against the RFP tag. Both mutant proteins were detected as a full-length band of ca. 218 kDa (Figure 5b). In contrast, the 106 kDa band, which corresponds to the RFP-tagged dCIRL NTF, was not present (Figure 5b). This shows that both GPS mutations abrogated the autoproteolytic activity of the dCIRL GAIN domain. Differential effect of GPS mutations on mechanosensitivity. (a) Structure of the dCIRL GPS region. The GPS separates NTF from CTF in proteolyzable aGPCRs. The C-terminal cleavage component contains the Stachel sequence, a potent receptor agonist in many aGPCRs (light blue). Magenta: conserved, mutated residues that are necessary for GPS cleavage. (b) Western blot of whole fly protein extracts containing wildtype or proteolysis-defective GPS variants of dCIRL probed against an mRFP tag in the NTF. The dCIRL-GPSwt sample displays only a fragment corresponding to the cleaved NTF (ca. 106 kDa; filled circle), while the two GPS mutants contain a band representing the full-length receptor (ca. 218 kDa; open circle). (c) SIM images of dCIRLN-RFP fusion proteins with wildtype and proteolysis-resistant GPS in lch5. The protein is trafficked into dendrites and cilia, regardless of autoproteolytic cleavage. Scale bar 5 µm. (d) Receptor current recordings (average of 8 sweeps) of lch5 neurons under TTX inhibition highlight the divergent effects of the GPS mutations on mechanosensitivity (dark blue, dCirlH>A; light blue, dCirlT>A). (e) Quantification of tonic and phasic receptor current components. Despite abrogating GPS cleavage, the response profile of the dCirlH>A receptor variant is unaffected (900 Hz, phasic: p=0.464, tonic: p=0.460, Student’s t-test vs. dCirlRescue). In contrast, changing the first residue of the Stachel sequence in dCirlT>A mutants abolishes the receptor’s mechanosensory function, resulting in a dCirlKO response profile (900 Hz, phasic: p=0.030, tonic: p=0.023, Student’s t-test vs. dCirlRescue). Data are presented as mean ± SEM, n = 8 larvae per genotype. SIM images of immunostained mechanosensory neurons revealed that autoproteolysis is not required for membrane targeting of dCIRL to dendritic and ciliary compartments (Figure 5c). Interestingly, however, mechanically-induced receptor currents (Figure 5d,e) were differently affected by the two mutations. Whereas dCirlH>A neurons displayed wildtype responses, the dCirlT>A mutant delivered a null phenotype. These results demonstrate that dCIRL activation in vivo depends on an intact tethered agonist, but that NTF-CTF disruption is dispensable. To interrogate intracellular signaling by dCIRL we chose an optogenetic approach by utilizing the photoactivated adenylyl cyclase bPAC (Stierl et al., 2011) (iav-GAL4>UAS-bPAC). Photoinduced cAMP elevation in wildtype lch5 quenched neuronal activity to the level observed in dCirlKO mutants, while bPAC activation in the dCirlKO background did not further decrease action current frequencies significantly (Figure 6a–c). Conversely, pharmacological inhibition of adenylyl cyclase activity specifically rescued dCirlKO neuron function (Figure 6d). These observations indicate that increased cAMP levels attenuate the mechanosensory response and suggest that dCIRL modulates neuronal activity by suppressing cAMP production. 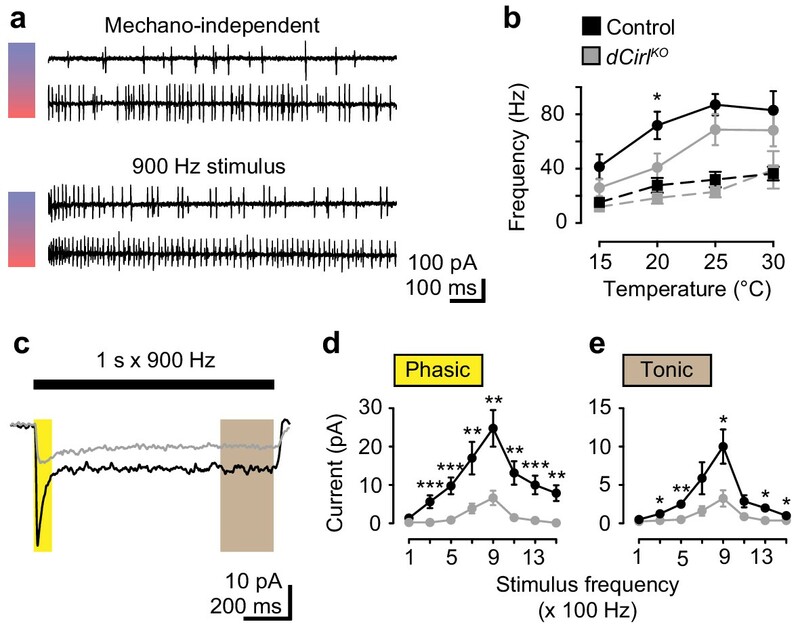 (a) Example current recordings from wildtype lch5 neurons during only mechanical (upper panel) and combined mechanical-light stimulation (lower panel) demonstrate the suppressive effect of cAMP elevation by bPAC on the mechanically-evoked action current frequency. (b) Protocol for combined mechanical stimulation and optogenetic cAMP production via bPAC photoactivation. (c) The mechanosensory response (action current frequency) of wildtype lch5 neurons is decreased to the level of dCirlKO larvae by increasing cAMP concentrations through light-induced bPAC stimulation (blue bar). In contrast, dCirlKO neurons are unaffected by light stimulation. Data are presented as mean ± SEM, n denotes number of animals. iav-GAL4>UAS-bPAC; wt (black, n = 9); iav-GAL4>UAS-bPAC; dCirlKO (gray, n = 10); iav-GAL4; wt (brown, n = 9). (d) Pharmacological inhibition of adenylyl cyclase activity using 100 µM SQ22536 rescues mechanically-evoked action current frequencies in dCirlKO lch5 neurons. Data are presented as mean ± SEM. Event frequency at 900 Hz without inhibitor: Control: 74.9 ± 8.67 Hz; dCirlKO: 43.88 ± 10.48 Hz; p=0.0287, Student’s t-test. Event frequency at 900 Hz with inhibitor: Control: 82.63 ± 10.51 Hz; dCirlKO: 57.25 ± 13.69 Hz; p=0.2103; n = 8 per genotype and condition. Next, we employed the FRET-based cAMP sensor Epac1-camps (Maiellaro et al., 2016; Nikolaev et al., 2004) to directly visualize neuronal cAMP dynamics during mechanical stimulation (Figure 7a). Application of the adenylyl cyclase agonist forskolin (FSK) produced similar relative FRET changes in wildtype and dCirlKO neurons, indicating comparable basal cAMP levels (Figure 7—figure supplement 1). However, whereas bouts of mechanical vibration reproducibly triggered a cAMP decrease in wildtype neurons, this second messenger signal was abrogated in dCirlKO mutants (Figure 7b,c). This was corroborated by coupling assays of dCIRL, in which a 12 amino acid synthetic peptide (P12), corresponding to the receptor’s Stachel sequence, was sufficient to stimulate Gαi (Figure 7—figure supplement 2). dCIRL reduces cAMP levels in sensory neurons in response to mechanical stimulation. (a) Schematic structure of the cAMP sensor Epac1-camps, which changes its conformation and fluorescence property upon binding of cAMP. Corresponding pseudocolor FRET images (YFP/CFP ratios) of Ich5 neurons (iav-GAL4>UAS-Epac1-camps) at low and high cAMP concentrations. Scale bar 10 µm. (b) Absolute FRET values (YFP/CFP ratios) recorded in control and dCirlKO Ich5 neurons, corresponding to the region of interest depicted in (a). In order to ensure a dynamic sensor range, 0.5 µM FSK was first added to the preparation (Maiellaro et al., 2016). Mechanical stimulation (900 Hz, pink bar) decreases cAMP levels in control but not in dCirlKO Ich5 neurons. At the end of the experiment, maximal FRET responses are induced by 10 µM FSK and 100 µM IBMX (3-Isobutyl-1-methylxanthin), a non-selective phosphodiesterase inhibitor. (c) Average time course of piezo-induced FRET changes in control and dCirlKO Ich5 neurons. Data are expressed as percentages of the low forskolin response and presented as mean ± SEM. ΔFRET at 70 s: Control: 16.28 ± 4.05%, n = 14; dCirlKO: 0.147 ± 3.78%, n = 6 larvae. Number denotes p value of comparison at 70 s with a Student’s t-test. See also Figure 7—figure supplements 1 and 2. Here we demonstrate how a GPCR can specifically shape mechanotransduction in a sensory neuron in vivo. This study thus serves a two-fold purpose. It delineates pivotal steps in the activation paradigm of aGPCRs and sheds light on the contribution of metabotropic signals to the physiology of neuronal mechanosensation. While there is ongoing discussion whether metabotropic pathways are suitable to sense physical or chemical stimuli with fast onset kinetics, due to the supposed inherent slowness of second messenger systems (Knecht et al., 2015; Wilson, 2013), our results demonstrate that the aGPCR dCIRL/Latrophilin is necessary for faithful mechanostimulus detection in the lch5 organ of Drosophila larvae. Here, dCIRL contributes to the correct setting of the neuron’s mechanically-evoked receptor potential. This is in line with the location of the receptor, which is present in the dendritic membrane and the single cilium of ChO neurons, one of the few documentations of the subcellular location of an aGPCR in its natural environment. The dendritic and ciliary membranes harbor mechanosensitive Transient Receptor Potential (TRP) channels that elicit a receptor potential in the mechanosensory neuron by converting mechanical strain into ion flux (Cheng et al., 2010; Kim et al., 2003; Zhang et al., 2015). Moreover, two mechanosensitive TRP channel subunits, TRPN1/NompC and TRPV/Nanchung, interact genetically with dCirl (Scholz et al., 2015). The present study further specifies this relationship by showing that the extent of the mechanosensory receptor current is controlled by dCirl. This suggests that the activity of the aGPCR directly modulates ion flux through TRP channels, and highlights that metabotropic and ionotropic signals may cooperate during the rapid sensory processes that underlie primary mechanosensation. The nature of this cooperation is yet unclear. Second messenger signals may alter force-response properties of ion channels through post-translational modifications to correct for the mechanical setting of sensory structures, e.g. stretch, shape or osmotic state of the neuron, before acute mechanical stimuli arrive. Indeed, there are precedents for such a direct interplay between GPCRs and channel proteins in olfactory (Connelly et al., 2015) and cardiovascular contexts (Chachisvilis et al., 2006; Mederos y Schnitzler et al., 2011; 2008; Zou et al., 2004). ChOs are polymodal sensors that can also detect thermal stimuli (Liu et al., 2003). We show that dCIRL does not influence this thermosensory response (between 15°C and 30°C) emphasizing the mechano-specific role of this aGPCR. Replacing sensory input by optogenetic stimulation supports this conclusion, as ChR2-XXM evoked normal activity in dCirlKO larvae. Turning to the molecular mechanisms of dCIRL activation, we show that the length of the extracellular tail instructs receptor activity. This observation is compatible with an extracellular engagement of the dCIRL NTF with cellular or matricellular protein(s) through its adhesion domains. Mammalian latrophilins were shown to interact with teneurins (Silva et al., 2011), FLRTs (O'Sullivan et al., 2014) and neurexins 1β and 2β (Boucard et al., 2012) suggesting that the receptors are anchored to opposed cell surfaces through their ligands. However, FLRTs do not exist in Drosophila and an engagement of dCIRL with the other two candidate partners could not be detected to date (N.S. and T.L., unpublished observations) indicating that other interactors may engage and mechanically affix dCIRL. Our data support a model where the distance between ligand-receptor contact site and signaling 7TM unit determines the mechanical load onto the receptor protein and its subsequent signal output. This scenario bears similarity to the role of the cytoplasmic ankyrin repeats of NompC, which provide a mechanical tether to the cytoskeleton of mechanosensory cells, and are essential for proper mechanoactivation of this ionotropic sensor (Zhang et al., 2015). aGPCR activation occurs by means of a tethered agonist (Stachel) (Liebscher et al., 2014; Monk et al., 2015; Stoveken et al., 2015), which encompasses the last β-strand of the GAIN domain. Structural concerns imply that after GAIN domain cleavage a substantial part of the Stachel remains enclosed within the GAIN domain and should thus be inaccessible to interactions with the 7TM domain (Araç et al., 2012; Prömel et al., 2013). These considerations beg the question how the tethered agonist gets exposed to stimulate receptor activity, and how this process relates to the mechanosensitivity of aGPCRs. Two models account for the elusive link between these critical features (Langenhan et al., 2013; Liebscher et al., 2013). Mechanical challenge to the receptor causes: (1) physical disruption of the heterodimer at the GPS thereby exposing the tethered agonist. In this scenario, GPS cleavage is absolutely essential for receptor activity; (2) Allosteric changes of the GAIN domain, e.g. through isomerization of the tethered agonist-7TM region, that allow for the engagement of the Stachel with the 7TM. In this situation, GPS cleavage and disruption of the NTF-CTF receptor heterodimer are not necessary for receptor activity. We found that autoproteolytic cleavage is not required for the perception and transduction of vibrational mechanical stimuli by dCIRL. We further uncovered that the concomitant disruption of Stachel and autoproteolysis disables dCIRL’s mechanosensory function in ChO neurons. Thus, the tethered agonist concept (Monk et al., 2015) pertains to aGPCRs in Drosophila. Notably, these findings also demonstrate that classical GPS mutations have similar biochemical but different physiological effects in vivo. Finally, we interrogated intracellular signaling by dCIRL. 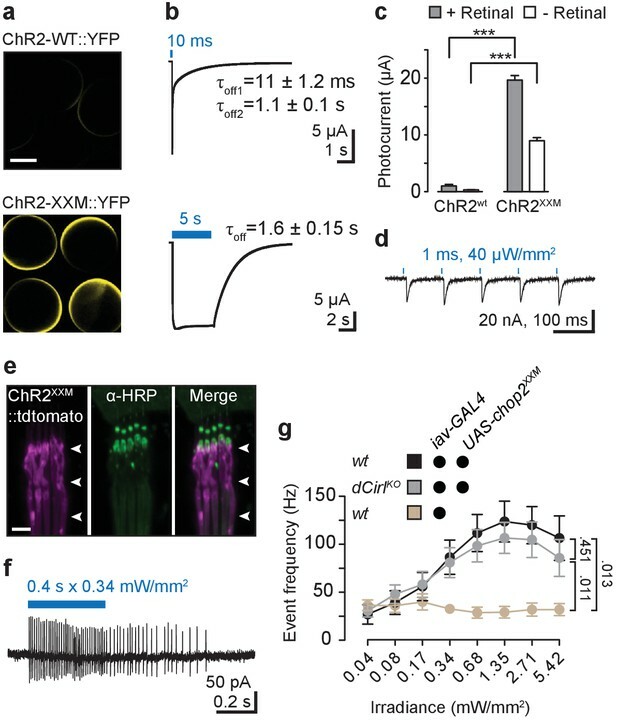 In contrast to previously described Gαs coupling of rat and nematode latrophilins (Müller et al., 2015), the mechanosensory response of ChO neurons was decreased by optogenetic augmentation of adenylyl cylcase activity, and the mechanosensory deficit of dCirlKO mutants was rescued by pharmacological inhibition of adenylyl cyclase. 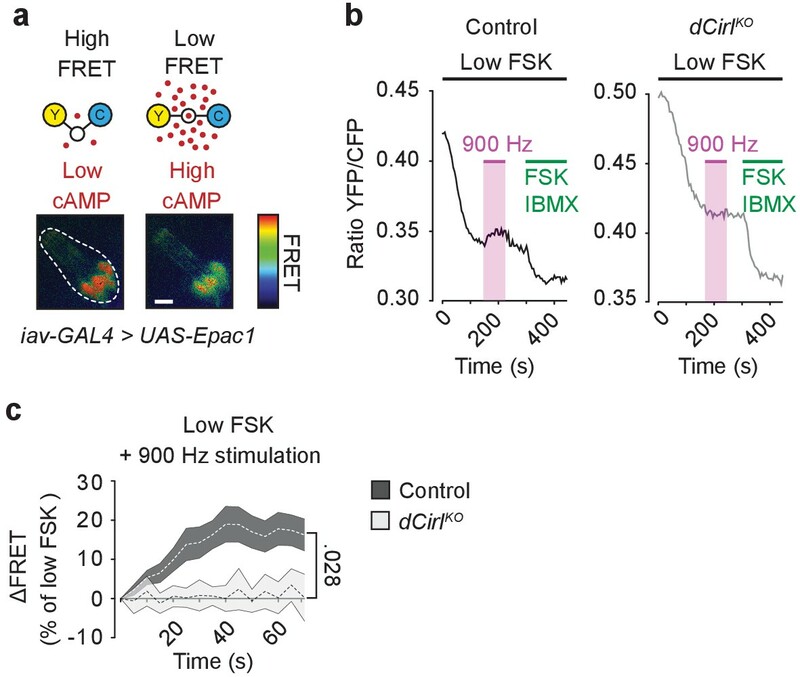 FRET measurements also directly demonstrated that mechanical stimulation reduces the cAMP concentration in the sensory neurons, and that this mechano-metabotropic coupling depends on dCIRL. Thus, dCIRL converts a mechanosensory signal into a drop of cAMP levels. This suggests that the Drosophila latrophilin entertains a cascade that inhibits adenylyl cyclases or stimulates phosphodiesterases in ChO neurons, and that G-protein coupling pathways by latrophilin homologs may depend on species and/or cell type. Members of the aGPCR family are associated with a vast range of physiological processes extending beyond canonical neuronal mechanosensation. For example, dysfunction of ADGRG1/GPR56 causes polymicrogyria (Piao et al., 2004), ADGRF5/GPR116 controls pulmonary surfactant production (Bridges et al., 2013), genetic lesions in many aGPCR loci are associated with a roster of cancer types (Kan et al., 2010; O'Hayre et al., 2013) and ADGRE2/EMR2 regulates mast cell degranulation (Boyden et al., 2016). Intriguingly, a point mutation in the GAIN domain of ADGRE2 sensitizes the receptor to mechanical stimuli in kindreds of patients suffering from vibratory urticaria. Our results now provide a basis to test the generality of the concept that aGPCRs are metabotropic mechanosensors also outside classical mechanosensory structures, and aid in understanding the contribution of ailing aGPCR signaling in diseased tissues. pMN4: A 0.1 kb fragment annealed from primers mn_1F/2R containing a 3xflag-tag flanked by two AgeI sites was inserted into the genomic dCirl construct pTL393 (Scholz et al., 2015) at its NcoI site. Subsequently, a 0.7 kb fragment including a monomeric RFP cassette was amplified from pTL391 using primers mn_3F/4R and introduced in the resulting clone via AgeI in order to replace the 3xFlag-tag sequence. pMN9: T>A GPS cleavage-deficient dCirl was created with QuikChange site-directed mutagenesis of pTL370 using primers mn_12F/13R containing the altered GPS sequence. pMN10: T>A GPS cleavage-deficient dCirlN-RFP containing the extracellular mRFP cassette was created with QuikChange site-directed mutagenesis of pMN4 using primers mn_12F/13R containing the altered GPS sequence. pMN38: H>A GPS cleavage-deficient dCirlN-RFP containing the extracellular mRFP cassette was created with QuikChange site-directed mutagenesis of pMN4 using primers mn_38F/39R containing the altered GPS sequence. pMN44: H>A GPS cleavage-deficient dCirl was created with QuikChange site-directed mutagenesis of pTL370 using primers mn_38F/39R containing the altered GPS sequence. pNH98: The 3xCD4 coding region interspersed each with six V5-tags was engineered from MWG Eurofins (pNH95). Subsequently, a 2.8 kb AgeI fragment of pNH95 was cloned into pMN4. pTL512: The cDNA of the dCirl E splice variant was amplified from EST clone RE25258 obtained from the Drosophila Genomics Resource Center using primers tl_508F/509R and cloned into pCR-BluntII-TOPO (Thermo Fisher Scientific). A 150 bp fragment encoding the signal peptide of human GPR56 and a HA-tag was amplified with primers tl_514F/515R from a template vector and inserted into the plasmid via ApaI/EcoRV generating pTL506. A 5.1 kb BglII/SpeI fragment was released from pTL506 and inserted into the pcDps backbone generating pTL512. pTL518: A 0.2 kb fragment was amplified off pTL370 (Scholz et al., 2015) with primers tl_540F/549R, cut with EcoRV and inserted into the EcoRV site of pTL506 to complete the RBL domain coding region. pTL520: An annealed fragment of primers tl_542F/543R was ligated into the AgeI site of pTL512. pTL521: An annealed fragment of tl_542F/543R was ligated into the AgeI site of pTL518. pTL526: A 2.2 kb SpeI/AfeI-fragment of pTL507 was ligated with a 6.1 kb SpeI/AfeI-fragment of pTL520. pTL535: A 0.15 kb fragment encoding the signal peptide of the mouse ADGRL1/LPHN1 receptor was amplified off pSP113 (Müller et al., 2015), cut with EcoRI and BglII and inserted into pTL526. pTL536: A 2.2 kb SpeI/AfeI-fragment of pTL507 was ligated with a 6.3 kb SpeI/AfeI-fragment of pTL521. A 0.15 kb fragment, amplified from pSP113 with primers tl_550F/551R, was cut with EcoRI and BglII and inserted into the resultant plasmid. pTL564: To generate the dCirl length sensor control construct, which includes a single Bungarotoxin binding site and hemagglutinin-tag in the RBL-HRM connecting region, a 3.5 kb MluI/PacI fragment was released from pTL555 (subclone of exons 3–6 of dCirl tagged with Bungarotoxin-HA-tag in pMCS5 backbone) and inserted into pTL393 (attB-flanked genomic dCirl wild-type construct). pTL665: A 4.9 kb AgeI/XbaI fragment of pMN12 was cloned into pTL655. pTL666: A 5.1 kb AgeI/XbaI fragment of pMN13 was cloned into pTL655. pTL696: A 2.9 kb fragment was amplified off pTL526 using primers tl_727F/728R. A second 3.4 kb fragment was amplified off pSA3 using primers tl_729F/696R. Both fragments were fused using the Gibson cloning kit (NEB). pTL697: A 2.9 kb fragment was amplified off pTL526 using primers tl_730F/728R. A second 3.4 kb fragment was amplified off pSA3 using primers tl_729F/696R. Both fragments were fused using the Gibson cloning kit (NEB). All QuikChange-based PCRs were performed with pfu polymerase (Agilent). All amplicons were validated by restriction analyses followed by sequencing of the entire amplified exonic region. An established Cre recombinase-based protocol was used to remove the w+-marker located in close proximity to the dCirl locus in dCirlKO (Huang et al., 2009, 2008). w+-marked vectors bestowed with an attB site were injected into phiC31[3xP3-RFP-3xP3-GFP-vas-PhiC31]; dCirlKO attP-loxP;; embryos (Scholz et al., 2015). Subsequently, w+ served as the selection marker to identify recombinants. Precise transgene insertion was validated by PCR genotyping. cRNA was generated with the AmpliCap-MaxT7 High Yield Message Maker Kit (Epicentre Biotechnologies) using a NheI-linearized pGEM-HE XXM YFP plasmid. Oocytes were injected with 20 ng cRNA and incubated in ND96 solution (96 mM NaCl, 2 mM KCl, 1 mM MgCl2, 1 mM CaCl2, 10 mM HEPES and 50 µg/ml Gentamycin, pH 7.4) containing 1 μM all-trans-retinal (short retinal; Sigma-Aldrich), unless indicated otherwise. Staining procedures were essentially performed as previously described for the NMJ (Ehmann et al., 2014). For ChO imaging the following protocol was applied: third instar larvae were dissected in Ca2+-free HL-3 (Stewart et al., 1994), fixed in 4% paraformaldehyde for 10 min at room temperasture (RT) and blocked overnight at 4°C in 1% PBT (PBS with 1% Triton X-100, Sigma-Aldrich) supplemented with 5% normal goat serum (NGS) and 2% BSA. Primary antibodies were diluted in 1% PBT (5% NGS, 2% BSA) incubated at 4°C overnight. Next, the samples were rinsed twice and washed 3 × 20 min using 1% PBT. The secondary antibodies were added to 1% PBT (with 5% NGS) and incubated overnight at 4°C. After the samples were rinsed twice and washed 3 × 20 min with 1% PBT they were covered with Vectashield and stored for at least overnight at 4°C. The following primary antibodies were used: AcTub, 1:400 (RRID:AB_477585), ms-α-NompC (Lee et al., 2010) (1:200; RRID:AB_2568530), rabbit-α-GFP (1:500; RRID:AB_10790912), rabbit-α-RFP (1:500; RRID:AB_10781500). Secondary antibodies: α-HRP conjugated with Cy3 (RRID:AB_2338959) and Cy5 (Jan and Jan, 1982) (1:250, Dianova), α-HRP conjugated with Alexa Fluor-488 (Jan and Jan, 1982) (1:250; RRID:AB_2338965), Phalloidin conjugated with Alexa 488 (1:500; RRID:AB_2315147), Alexa Fluor-488-conjugated goat-α-mouse (RRID:AB_2534069) and goat-α-rabbit (RRID:AB_143165; each 1:250), Cy3-conjugated goat-α-rabbit (1:250; RRID:AB_2338006). Samples were mounted in Vectashield (Vector Laboratories). Confocal images were acquired with an LSM 5 Pascal (Zeiss) and for ChR2 stainings 100 µM retinal was added to the food. SIM images were recorded and processes with a commercial inverted SIM microscope (Zeiss Elyra) equipped with an oil-immersion objective (Plan-Apochromat 63x, NA 1.4 Oil Dic M27). Standard laser illumination at 488 nm, 561 nm and 642 nm was used for excitation of Alexa Fluor-488, Cy3 and Cy5-conjugated antibodies, respectively. Stacks of at least 5 planes were recorded with structured illumination from 5 rotational and 5 phase variations and processed with standard Elyra settings. Larvae were dissected in ice-cold Ca2+-free HL-3 and fixed overnight at RT using 6.25% glutaraldehyde in Sörensen buffer (pH 7.4; 50 mM KH2PO4, 50 mM Na2HPO4). The larval filets were washed 5 × 5 min in 100 mM Sörensen buffer and subsequently dehydrated in an aceton series (in percent: 30, 50, 75, 90, 100). Each incubation step lasted at least 30 min. Samples were transferred into teflon vessels, critically point dried (Critical Point Dryer, BAL-TEC CPD030) and adhered to 0.5 inch aluminium specimen stubs (Agar Scientific G301). Samples were placed into a Sputter Coater (BAL-TEC SCD005), flooded 3–4 times with argon in vacuo and subsequently metalized with gold-palladium. Imaging was done using a JEOL JSM-7500F equipped with a secondary-electron detector (SEI). Third instar larvae were dissected in ice-cold Ca2+-free HL3 (Stewart et al., 1994) and prepared for transmission electron microscopy essentially as previously described (Wagh et al., 2006; Wagner et al., 2015). Briefly, after dissection, the larval filets were fixed in 2.5% glutaraldehyde and 2.5% paraformaldehyde in either 0.1 M cacodylate buffer (CB) pH 7.3 for 2 hr at 4°C (Fix I) or in 0.05 M CB pH 7.2 for 45 min at 4°C (Fix II). For Fix I, the larvae were washed overnight in 4.5% sucrose in 0.1 M CB at 4°C, postfixed with 2% osmiumtetroxide in 0.014 M veronal acetate buffer pH 7.3 (VB, with 0.02% CaCl2 and 2.25% sucrose added) for 1.5 hr, washed in VB and dehydrated in ascending concentrations of ethanol. For Fix II, all steps including dehydration (see below) were carried out at 4°C. Larvae were washed in 0.05 M CB and postfixed in 2% osmiumtetroxide in the same buffer for 1.5–2 hr followed by contrasting with 0.5% aqueous uranyl acetate (UA) overnight, washing in dH2O and dehydrating in ethanol. After dehydration, all preparations were transferred to Epon via propylene oxide as intermedium, flat embedded in Epon, ultrathin sectioned (~80 nm), and contrasted with uranyl acetate (UA) and lead citrate according to standard protocols. Ultrathin sections were analyzed using a LEO 912 AB transmission electron microscope (Zeiss). Both fixation protocols gave similar results, with slightly better ultrastructure preservation using Fix I. Digitally recorded electron micrographic images were composed and adjusted for brightness and contrast using Photoshop (Adobe). Fly heads were collected in standard radioimmunoprecipitation assay buffer (RIPA buffer; 150 mM NaCl, 1% Triton X-100, 0.5% sodium deoxycholate, 0.1% SDS, 50 mM Tris [pH 8.0]) supplemented with protease inhibitor cocktail (1:1000; Sigma-Aldrich) and immediately frozen in liquid nitrogen. Next, heads were homogenized and supplemented with SDS-based protein buffer (Li-cor) and 2-mercaptoethanol (Merck). Next, samples were centrifuged for 5 min at 13,000 rpm (4°C), incubated for 10 min at 55°C, subjected to electrophoresis on a 4–12% Tris-Glycin SDS gel (Invitrogen) and blotted onto 0.2 µm nitrocellulose membrane (AmershamProtran). The membrane was blocked for 1 hr using Odyssey Blocking buffer (Li-cor) diluted 1:8 with 1 x PBS. For dCIRL3xCD4 detection ten fly heads of each genotype were collected and immediately frozen using liquid nitrogen. Subsequently, 20 µl 2% SDS was added and a glas stirrer was used to grind the heads before 8 µl of 4x Sample buffer (Li-cor) and 2 µl of 10% Triton X-100 was supplemented. Samples were cooked for 5 min at 95°C and centrifuged for 15 min at 13,000 rpm at RT. Gel electrophoresis was done using 4–12% Tris Glycine gels (Invitrogen). Protein was blotted onto 0.2 µm nitrocellulose membrane (Li-cor), blocked for 1 hr using Odyssey Blocking buffer (Li-cor) diluted 1:1 with 1x PBS. Blots were probed with primary antisera at the indicated concentrations for 1 hr at RT: rabbit-α-RFP (1:500), mouse-α-tubulinβ (1:1000, RRID:AB_528499), mouse-α-V5 (1:500; RRID:AB_2556564). After rinsing twice and 3 × 10 min washing steps, membranes were incubated with IRDye 680RD goat-α-rabbit (RRID:AB_10956166) and 800CW goat-α-mouse (1:15000; RRID:AB_10956588) for 1 hr at RT, and again rinsed twice and washed 3 × 10 min. Western blots were imaged with an OdysseyFc 2800 (Li-cor). Electrophysiological measurements were essentially carried out as previously described (Scholz et al., 2015). In brief, activity of lch5 neurons was recorded from the axon bundle using a suction electrode coupled to an EPC 10 USB amplifier (HEKA Instruments) and analyzed in Clampfit 10.2 (Molecular Devices). Mechanical stimulation was applied through a piezo-actuated, fire-sealed glass electrode placed on the muscle covering the cap cells. Spontaneously active neurons were stimulated optogenetically or at the indicated sine wave frequencies (three cycles of 1 s stimulation preceded by 1 s rest for each frequency). Data were sampled at 10 kHz and a notch filter was used to remove the specific stimulation frequency from the current trace. Pharmacological inhibition of adenylyl cyclase activity followed a full series of mechanical stimulation. Preparations were then incubated for 10 min with 100 µM SQ22536 (Merck) to inhibit adenylyl cyclase activity (Gao and Raj, 2001) before applying a second set of mechanical stimulation. Light from a mercury lamp (Nikon Intensilight C-HGFI) passed a GFP filter (460–500 nm band-pass) for photostimulation of lch5 neurons via ChR2-XXM::tdTomato (iav-Gal4>UAS-chop2XXM::tdTomato; 100 µM retinal food supplementation). Increasing light intensities (approx. 0.04, 0.08, 0.17, 0.34, 0.68, 1.35, 2.71, 5.42 mW/mm2) were applied with intermittent 10 s breaks. For bPAC experiments (iav-Gal4>UAS-bPAC), first 10 cycles of 1 s mechanical stimulation at 900 Hz followed by 1 s rest were applied without irradiation. After a 3 s break, this stimulation block was paired with continuous light stimulation (460–500 nm; ~8 mW/mm2). In order to isolate receptor currents, 4 µM TTX was added to the bath to block action potentials. For each frequency, either ten (Figure 2j–l) or three stimulation cycles (Figure 3g,h) were applied (1 s stimulation preceded by 1 s rest). Traces were low-pass filtered at 30 Hz before measuring the amplitudes of phasic (peak response) and tonic current components (average of last 200 ms). Genotypes were blinded for all electrophysiological recordings of ChOs. Larvae expressing ChR2-XXM::tdTomato in motoneurons (ok6-Gal4>UAS-chop2XXM::tdTomato) were raised in food supplemented with 100 µM retinal and dissected in ice-cold, Ca2+-free HL-3 (in mM: NaCl 70, KCl 5, MgCl2 20, NaHCO3 10, trehalose 5, sucrose 115, HEPES 5, pH adjusted to 7.2). The VNC was removed, the peripheral nerves were severed and two-electrode voltage clamp recordings were made from ventral longitudinal muscle 6 (clamped at −60 mV) in abdominal segments A2 and A3 at room temperature, in principle as previously described (Ljaschenko et al., 2013). Light-evoked EPSCs were triggered by blue light (440 nm; CoolLED) in HL-3 containing 1 mM CaCl2. Data were acquired with an Axoclamp 900A amplifier (Molecular Devices), signals were sampled at 10 kHz, low-pass filtered at 1 kHz and analysed with Clampfit 10.2. Two-electrode voltage-clamp recordings were performed with a conventional setup (amplifier: Turbo TEC-05 npi) at a holding potential of −100 mV in Ringer’s solution (110 mM NaCl, 5 mM KCl, 2 mM BaCl2, 1 mM MgCl2, 5 mM HEPES, pH 7.6). Photocurrents were evoked by a water-cooled diode pumped solid-state laser (473 nm, 12.4 mW/mm2). Recordings were obtained using WinEDR 3.4.2 (J. Dempster, University of Strathclyde) and stationary photocurrents were analyzed using pClamp 10.3.2 (Molecular Devices). Larvae expressing ChR2-XXM::tdTomato in mechanosensory neurons (iav-Gal4>UAS-chop2XXM::tdTomato; 100 µM retinal food supplementation) were placed in a petri dish (10 cm diameter, filled with 1% agar) and recorded under infrared illumination. In each set of experiments, seven larvae were analyzed for 30 s before and during illumination with blue LEDs (440 nm, ~3 µW/mm2). During light stimulation, the head swinging phase was defined as the time interval between repeated lateral movements of the anterior segment and two complete crawling sequences in forward direction. Light from a mercury lamp passed through a GFP excitation band-pass filter was used to photostimulate crawling larvae expressing tagged or untagged ChR2-XXM in motoneurons (ok6-Gal4 driver; 100 µM retinal food supplementation unless indicated otherwise). Measurements denote the time between light-induced immobilization and resumed movement (defined as anterior displacement of posterior end) during ongoing irradiation. Adult flies were transferred to a vertically positioned Petri dish (10 cm diameter) and stimulated with blue LEDs (440 nm) for 10 s. After 5 s, the dish was tapped and the immobilized individuals were counted. Ratiometric FRET imaging was performed using an upright epifluorescence microscope (Axio Observer, Zeiss) equipped with a water-immersion objective (63x, NA 1.1), a xenon lamp coupled to a monochromator (VisiView, VisiChrome), filters for CFP (436/20, 455LP dichroic) and YFP (500/20, 515LP dichroic) excitation, a beam splitter (DualView, Photometrics) with a 505LP dichroic mirror, emission filters for CFP (480/30) and YFP (535/40), and an electron-multiplied charge coupled device camera (Evolve 512, Photometrics). CFP and YFP images upon CFP excitation were captured every 5 s with 100 ms illumination time. FRET was monitored in real-time with the MetaFluor 5.0 software (Molecular Devices) as the ratio between YFP and CFP emission. The YFP emission was corrected for direct excitation of YFP at 436 nm and the bleedthrough of CFP emission into the YFP channel as previously described (Börner et al., 2011). Larval preparations expressing Epac1-camps in lch5 neurons (iav-GAL4>UAS-Epac1-camps) were imaged at RT and stimulated with FSK (0.5 or 1 µM) at the beginning of the experiment to accumulate cAMP and decrease the FRET signal to a plateau phase (low forskolin response). 0.5 µM and 1 µM FSK elicited the same amplitude of FRET changes and the results were pooled accordingly. The amplitude of the low forskolin response was calculated by averaging five data points immediately before the stimulation and at the plateau phase. The difference was expressed as a percentage of maximal FRET response, obtained by application of IBMX (100 µM) followed by additional forskolin stimulation (10 µM). Piezo-actuated stimulation was performed only during the plateau phase (10 sweeps of 3 × 1 s 900 Hz stimulation separated by 1 s rest, 1 s inter-sweep interval). The amplitude of the piezo-induced FRET change was calculated by averaging five data points immediately before and at the end of the mechanical stimulation block. The difference was expressed as a percentage of the low FSK response. Two quality criteria were used to assess cell health and failure to meet these resulted in exclusion of samples from further analysis: (1) stimulation with low FSK concentrations produced a FRET change and (2) did not saturate the sensor (i.e. subsequent stimulation with 10 µM FSK and 100 µM IBMX further decreased the FRET signal). Peptides were synthesized using standard Fmoc-chemistry on an automated peptide synthesizer MultiPep (Intavis AG). Final side chain deprotection and cleavage from the solid support was achieved using TFA, water and thioanisole (95:2.5:2.5 vol%). Peptides were subsequently purified to >95% purity by preparative RP-HPLC (Shimadzu LC-8) equipped with a 300 × 25 mm PLRP-S column (Agilent). For both analytical and preparative use, the mobile phases were water or acetonitrile, respectively, each containing 0.1% TFA. Samples were eluted with a linear gradient of 5–90% acetonitrile in water: 30 min for analytical runs and 90 min for preparative runs. Peptide characterization by analytical HPLC (Agilent 1100) and MALDI-MS (Bruker Microflex) yielded the expected [M+H]+ mass peaks. Peptides were dissolved in DMSO to 100 mM and stored at 4° C until use. For expression analyses and functional assays, transiently transfected COS-7 cells were used. COS-7 cells were cultivated in Dulbecco's Modified Eagle Medium (DMEM) supplemented with 10% fetal bovine serum, 100 U/ml penicillin and 100 μg/ml streptomycin at 37°C and 5% CO2 in a humidified atmosphere. For enzyme-linked immunosorbent assays (ELISA) to determine cell surface expression, cells were split into 48-well plates (3.8 × 104 cells/well), for total ELISA into 6-well plates (3 × 105 cells/well) and for cAMP accumulation or IP assays into 96-well plates (2 × 104 cells/well). After 24 hr cells were transfected with 0.5 µg/well receptor-encoding plasmid DNA for detecting cell surface expression, 1 µg/well for detecting total expression and 0.2 µg/well for analyzing response to peptides in functional assays using Lipofectamine 2000 (Invitrogen) according to manufacturer's protocol. For an estimation of total and cell surface expression, receptors carrying an N-terminal HA were analyzed with a rat anti-HA-peroxidase antibody (Roche) in indirect cellular ELISA as described previously (Schöneberg et al., 1998). To determine cAMP accumulation, COS-7 cells were washed 48 hr post transfection for 5 min with serum- and phenol red-free DMEM containing 1 mM IBMX. For analysis of agonistic peptides transfected cells were treated with 1 mM peptide in this cell medium. Incubation was stopped by aspirating medium and lysing cells in LI buffer (PerkinElmer Life Sciences). Samples were frozen at −20°C and thawed for detection of cAMP concentrations using the AlphaScreen cAMP assay kit (PerkinElmer Life Sciences) according to manufacturer's protocol and the Fusion AlphaScreen multilabel reader (PerkinElmer Life Sciences). For IP accumulation assays, the IP-One HTRF assay kit (CisBio) was used according to manufacturer´s protocol. In brief, transfected COS-7 cells were washed 48 hr post transfection with PBS and subsequently stimulated with 1 mM peptide in stimulation buffer (CisBio) for 30 min at 37°C. Incubation was terminated by lysing cells in lysis buffer on ice for 10 min and subsequent freezing at −20°C. Cell lysates were defrosted and subject to IP measurements in a 384-well format using the EnVision multilabel reader (PerkinElmer Life Sciences). Data were analyzed in Prism 5.0 (GraphPad). Group means were compared by two-tailed Student’s t-test. Where the assumption of normality of the sample distribution was violated as indicated by the D’Agostino and Pearsons omnibus normality test, group means were compared by two-tailed Mann-Whitney U test. Where indicated in figures asterisks denote the level of significance: *p≤0.05, **p≤0.01, ***p≤0.001. Journal of Biological Chemistry 287:9399–9413. New England Journal of Medicine 374:656–663. American Journal of Respiratory Cell and Molecular Biology 49:348–357. European Journal of Pharmacology 418:111–116. Journal of Biological Chemistry 279:31823–31832. Current Opinion in Pharmacology 11:112–116. Journal of Biological Chemistry 279:37215–37218. Trends in Pharmacological Sciences 34:470–478. Journal of Biological Chemistry 286:1181–1188. Journal of Comparative Neurology 523:2457–2475. Thank you for submitting your article "Mechano-dependent signaling by Latrophilin/CIRL quenches cAMP in proprioceptive neurons" for consideration by eLife. Your article has been reviewed by two peer reviewers, and the evaluation has been overseen by Richard Aldrich as the Senior Editor and Hugo Bellen as the Reviewing Editor. The following individuals involved in review of your submission have agreed to reveal their identity: Wayne Johnson (Reviewer #1); Daniel F Eberl (Reviewer #2). Both reviewers are very positive and we commend you for your fine paper. Please address the comments of the reviewers which are all minor. 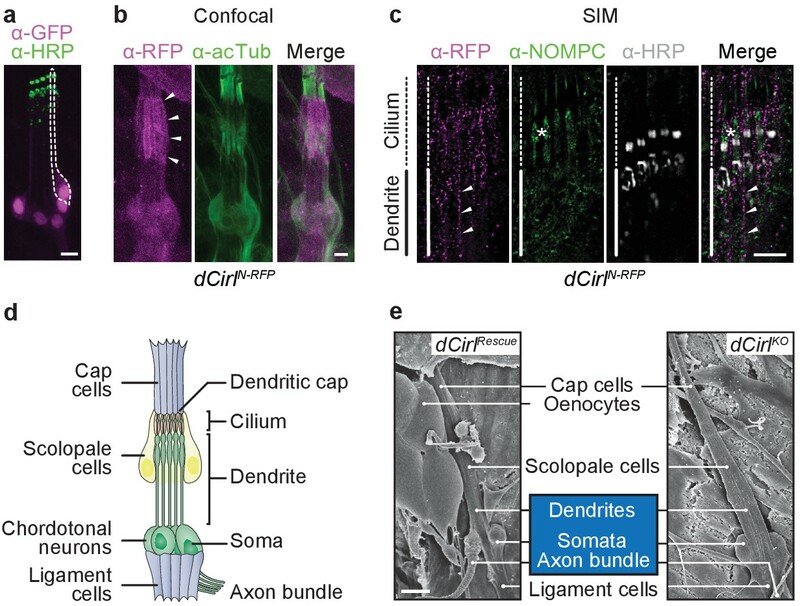 This is an impressive and well written manuscript with an abundance of data supporting the authors conclusions that the dCirl protein in larval chordotonal neurons plays a role in mechanosensory signaling. This manuscript is an extension of earlier work from the authors linking dCirl to mechanosensation using genetic, behavioral, electrophysiological and imaging approaches. Previous work characterized a dCirl mutant strain demonstrating dCirl-dependent mechanosensory signaling in chordotonal organs. Key findings provided in this manuscript attempt to further describe the role of aGPCR structural domains in neuron-specific function and to identify downstream metabotropic signaling pathways modified by dCirl activation. The bulk of the work is clearly presented and interpreted justifiably to support major conclusions of the studies. These results make a significant contribution to the area and are deserving of publication. The manuscript titled 'Mechano-dependent signaling by Latrophilin/CIRL quenches cAMP in proprioceptive neurons' by Scholz et al. is an exciting new paper which for the first time provides a molecular model for signal transduction for adhesion GPCRs in Drosophila. The authors show that Latrophilin/dCIRL, which is a Drosophila adhesion GPCR, is essential for both the initial step of mechanreception (conversion of mechanical stimuli to receptor current) and also downstream, when the second messenger cascade is regulated through decrease of cAMP in chordotonal neurons in larval lch5. Furthermore, this activity does not affect general excitability of the neurons, since thermosensory function and ontogenetic activation of the chordotonal neurons are not affected by dCIRL-KO. This paper is a continuation of the first paper by Scholz et al., 2015, where they show that dCIRL is involved in the initial mechanotransduction step in Drosophila proprioception and that it genetically interacts with the mechanically gated NompC channel. 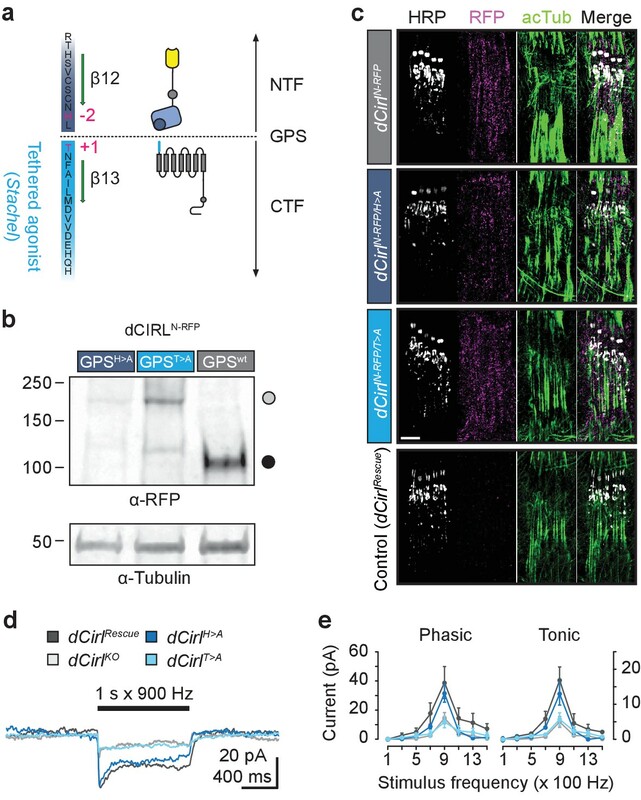 Here they characterize with more precision the subcellular localization within the cilia and neuronal dendrites of the chordotonal organs, localizing adjacent to TRPN1/ NompC which is the site of ionotrophic mechanosensation, shedding light on the molecular function of the GPCR. This is the first direct evidence showing how the Drosophila aGPCR receptor dCIRL/Latrophilin modulates the transduction of mechanical stimuli to electrical signal (receptor current) in the chordotonal neurons in larval lch5. The authors also show that the length of extracellular N-terminal fragment (NTF) of dCIRL and the tethered agonist of the receptor (Stachel) is critically important for mechanotransduction. They further demonstrate that this process is independent of the autoproteolytic property of dCIRL through the GAIN domain. This study has been conducted carefully and is technically sound. This paper is important in understanding the molecular cascade from the first initiation of mechanical signal to how the signal is transmitted further downstream to specific intracellular destinations in the sensory neuron. Experiments examining the effect of varied lengths of dCirl NTF on response frequency (Figure 4) are perhaps overstated. It cannot be concluded from these few experiments whether the NTF inserts directly affect interactions with extracellular matrix components or simply destabilize the protein leading to some loss of function. Since "expression" of the dCirl[3XCD4] variant results in essentially a null phenotype, it is not clear whether the variant protein is inherently unstable or is not expressed at all leading to the loss-of-function phenotype. I could not find evidence of stable expression of the dCirl[3XCD4] variant in vivo in the manuscript. Demonstration of expression using Western blot or imaging is used for numerous other modified constructs in the manuscript but I could not find the data for this one protein. If it is there somewhere please indicate. Otherwise, please provide evidence of stable expression. In addition, the concluding sentence of that section: "We conclude that ECD length and tensile properties adjust dCIRL's response towards mechanical challenge" is vastly overstated based upon this minimal set of constructs and experiments. This concluding sentence should be modified to more accurately reflect the significance of these experiments. Although I am not requesting the removal of this entire section from the manuscript, it does not add significantly to the manuscript without a more extensive characterization that would be outside the scope of this paper. A significant component of the model for the role of dCirl in mechanosensory neurons is the functional relationship with previously characterized mechanosensory ionotropic channels such as the TRP channels nompC and nanchung. Previously published work from the authors demonstrated clear genetic interactions between the dCirl mutant and both nompC and nan mutants. Figure 1C provides images demonstrating the subcellular localization of dCIRL in dendrites and cilium along with nompC localization. In the figure legend, it is stated that dCirl is subcellularly localized "next to the TRP channel NompC". This statement suggests a subcellular colocalization of dCirl and nompC consistent with some sort of direct interaction or adjacent signaling mechanism. Since the spatial relationship between dCirl and nompC proteins in the membrane is not known and a direct physical contact is not essential to the proposed model, this is a confusing statement. Although still valid, the data supports only a possible coexpression in similar subcellular regions of the chordotonal neurons. The statement that dCirl is localized "next to" nompC is imprecise and overstated. This should be rephrased to more accurately reflect the strength and significance of the results. 1) Figure 2: In 2B – please clarify what does the n represent – number of oocytes recorded from? In 2C it is not clear which bar is significant in relation to other bars on the bar graph. Please use brackets to denote the statistical significance between the two bars. In 2G the figure legend in says 'number denotes p values of comparison of event frequency' however it seems that the p value is not given in the figure. 2) Figure 3: In 3B, mechanosensory signal has been recorded from the lch5 for n=8. It is not clear whether these are recording from 8 individual animals or 8 different lch5 organs (in fewer animals or even a single animal). Please clarify. 3) Same comment regarding Figure 4B, where the lch5 is recorded for effect of elongation of the NTF. The authors need to make clear the number of animals the data represent. 4) ChR2XXM and Chop2XXM have been used interchangeably in figure and main body of text (Figure 2C and 2G expanded genotype explained in the subsections “Fly culture conditions and stocks” and “Chordotonal neurons”). Please use only one denotation, perhaps at first mention indicate the alternate terminology, but stick to only one throughout. 5) Figure 6: In 6D it has been very nicely shown that pharmacological inhibition of adenylyl cyclase by SQ22536 can rescue mechanically evoked current in the dCIRLKO. Perhaps it would be more conclusively demonstrated if a negative control such as a NompC null mutant is also included showing that the pharmacological rescue of dCIRLKO mutant is dependent on mechanical stimulation? This is a relatively minor suggestion, and we do not feel strongly that this experiment must be done before publication. 6) In Fig7—figure supplement 1 – please indicate on the bar graph which one is the control and the dCIRLKO. 7) Discussion, fifth paragraph: spelling of matricellular. 8) Discussion, fifth paragraph: data support (not data supports). 9) Discussion, eighth paragraph: spelling of cyclase. 10) Discussion, last paragraph: aGPCR (not aGPCRs). Experiments examining the effect of varied lengths of dCirl NTF on response frequency (Figure 4) are perhaps overstated. It cannot be concluded from these few experiments whether the NTF inserts directly affect interactions with extracellular matrix components or simply destabilize the protein leading to some loss of function. Since "expression" of the dCirl[3XCD4] variant results in essentially a null phenotype, it is not clear whether the variant protein is inherently unstable or is not expressed at all leading to the loss-of-function phenotype. I could not find evidence of stable expression of the dCirl[3XCD4] variant in vivo in the manuscript. Demonstration of expression using Western blot or imaging is used for numerous other modified constructs in the manuscript but I could not find the data for this one protein. If it is there somewhere please indicate. Otherwise, please provide evidence of stable expression. We now provide evidence for stable expression of the dCirl[3XCD4] variant allele product by Western blot against poly-V5 tags inserted into each of the CD4 modules. The blot was performed on protein extracts from animals expressing the dCirl[3XCD4] protein, and two negative controls lacking the 3xCD4 spacers were included for specificity control. Full length protein has a calculated molecular weight of appx. 298 kDa, NTF-only dCirl[3XCD4] of appx. 177 kDa. As the GPS of this allele is cleavable only the NTF containing the CD/V5 modules is visible on the SDS gel after denaturing. Western blot analysis shows the stable expression of the dCIRL3xCD4 fusion protein in vivo. No full-length protein is visible indicating that autoproteolytic cleavage is not affected by the length extension of the NTF. We have documented these results in a new panel in Figure 4 (now Figure 4C), inserted references to it at the appropriate place within the manuscript (subsections “dCIRL NTF length determines mechanosensitivity of chordotonal neurons” and) and extended the related methods section by the western blot protocol (subsection “Immunoblots”). In addition, the concluding sentence of that section: "We conclude that ECD length and tensile properties adjust dCIRL's response towards mechanical challenge" is vastly overstated based upon this minimal set of constructs and experiments. This concluding sentence should be modified to more accurately reflect the significance of these experiments. Although I am not requesting the removal of this entire section from the manuscript, it does not add significantly to the manuscript without a more extensive characterization that would be outside the scope of this paper. 1) Figure 2: In 2B please clarify what does the n represent – number of oocytes recorded from? In 2C it is not clear which bar is significant in relation to other bars on the bar graph. Please use brackets to denote the statistical significance between the two bars. In 2G the figure legend in says 'number denotes p values of comparison of event frequency' however it seems that the p value is not given in the figure. Figure 2B: n represents the number of individual oocytes recorded from. We have added a statement to the figure caption to clarify this. Figure 2C: We have modified Figure 2C by inserting brackets to indicate the relationship of statistically compared datasets. Figure 2G: We apologize for omitting the p values as indicated in the figure caption. We have now inserted them in the figure panel. In this experiment, n=8 denotes lch5 recordings from 8 different animals. We have added a statement to the figure caption to clarify this. As in all other experiments, n equals lch5 recordings from individual animals. We have added a statement to the figure caption to clarify this (Figure 4 legend). 4) ChR2XXM and Chop2XXM have been used interchangeably in figure and main body of text (Figure 2C and 2G expanded genotype explained in the subsections “Fly culture conditions and stocks” and Chordotonal neurons”). Please use only one denotation, perhaps at first mention indicate the alternate terminology, but stick to only one throughout. Chop2 denotes the apoprotein (without retinal), which we have genetically encoded and transgenically expressed in the animals as described. Therefore, all references indicating genotypes use Chop2-XXM (=channelopsin) as descriptor, e.g. UAS-chop2XXM. ChR2-XXM (=Channelrhodopsin) denotes the apoprotein that is bound to its chromophore retinal after protein translation. ChR2 therefore is the photoactivatable version of Chop2 that we used in functional assays. All references to the functional interrogation of or with the optogenetic actuator therefore use ChR2-XXM as descriptor. We feel that for clarity and also to be in accordance with terminological conventions in the optogenetics field the distinction between both terms should be maintained. We also fully agree that a clear denotation should be used and have now briefly defined both terms at first mention (subsection “Optogenetic stimulation of chordotonal neurons bypasses dCIRL-dependence”, first paragraph). We thank the reviewer for the comment and indeed such an experiment would further strengthen the conclusions of this part of the manuscript. We will conduct such control measurements in due course but, as the reviewer suggests, would leave the dataset in the current manuscript as is. We apologize for the oversight and have added the genotype designations to Figure 7C and Figure 7—figure supplement 1. We thank E Jöst and R Gueta for their help with the optogenetic actuators, D Bunsen and F Helmprobst for assistance with scanning electron microscopy, N Ehmann for discussions, and M Lohse and M Heckmann for support. This work was supported by grants from the Deutsche Forschungsgemeinschaft to TL (FOR 2149/P01 and P03, SFB 1047/A05, TRR 166/C03, LA2861/7-1), RJK (FOR 2149/P03, SFB 1047/A05, TRR 166/B04, KI1460/4-1), GN (SFB 1047/A03), MS (TRR 166/A04 and B04) and SP (FOR 2149/P02). GN acknowledges support provided through the Prix-Louis-Jeantet. Stocks obtained from the Bloomington Drosophila Stock Center (NIH P40OD018537) were used in this study. © 2017, Scholz et al. Signals from two different membrane proteins are combined to modulate how strongly sensory neurons respond to mechanical force.